The What A Cartoon! 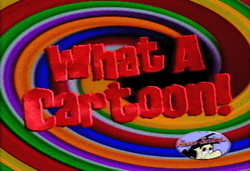 Show (originally known as World Premiere Toons, and later renamed The Cartoon Cartoon Show) was a series of cartoon shorts produced to air on Cartoon Network in the mid-1990s. The president of Hanna-Barbera at the time wanted to recreate the glory days of Western Animation by allowing creators to produce original short cartoons to be aired on Cartoon Network. The premiere of the project was on a special hosted by Space Ghost. Some of the cartoons were popular enough to be made into series, (Dexter's Laboratory, The Powerpuff Girls, Courage the Cowardly Dog, Johnny Bravo, Cow and Chicken, etc) Two wound up being the prototype for a much more popular toon later (Steve & Larry who would become Peter and Brian for Family Guy and Kenny and the Chimp were retooled into Codename: Kids Next Door). While others faded into obscurity like Yoink of the Yukon, Pfish & Chip, Yuckie Duck, and Shake & Flick. They even made a few shorts of The Flintstones. Its spiritual successor was meant to be Cartoonstitute (headed by two popular animators who got their start on WAC: Craig Mc Cracken and Rob Renzetti) , but that sadly never got off the ground. All CGI Cartoon: "Strange Things". Artistic License History: Gramps. His grandkids keep pointing out errors in his story and how he actually lived his life. When he mentions in his story that the president was a statuesque woman, he begs them to let this part remain unchanged when they point out that America never had a female president. Captain Ersatz: The Colonel Sanders ghost from Podunk Possum. Captivity Harmonica: Pizza Boy in No Tip. The Chew Toy: Poor, poor Shake from Shake & Flick. A literal one, at that. Christmas Episode: "George and Junior's Christmas Spectacular". Deranged Animation: Anything directed by Pat Ventura: "Yuckie Duck", "Sledgehammer O'Possum", and "George and Junior". Also "Buy One, Get One Free", which has visual influences from The Ren and Stimpy Show (not hurt by a few staff members who worked on that show). Also the two Ralph Bakshi shorts "Babe! He Calls Me" and "Malcom and Melvin", and "Tales of Worm Paranoia", directed by Eddie Fitzgerald. Dueling Shows: With Oh Yeah Cartoons, though not until the late Nineties. Frothy Mugs of Water: Averted in Captain Buzz Cheaply: A Clean Getaway. Groin Attack: Fat Cats in Drip Dry Drips features a scene where Louie accidentally hits the president in the grapes when he was doing his measurements. Here We Go Again: The ending of "Godfrey and Zeek". Kid with the Leash: Mina and the Count. Mad Bomber: Pfish & Chip's stock in trade is to catch these guys. Manatee Gag: Being the predecessor of Family Guy, Steve & Larry naturally had some. Mime-and-Music-Only Cartoon: "Help? ", which has no dialog aside from Jof's "Help!" Noodle Incident: Whatever happened to Grandma in Gramps. "SHE WAS DEAD WHEN I GOT THERE!!" The Other Darrin: Sledgehammer O'Possum was first voiced by Faizon Love in "Out and About". Then, in his second cartoon, "What's Goin' On Back There", he is voiced by T.K. Carter. Punctuated! For! Emphasis! : (After seeing a zombie) AAAAAHHH!!! *whack* OH! *whack* MAH! *whack* GAAAWD! : The opening theme. "WHAT! A! CARTOOOOOOOOON!" Spin-Off: Famously, Dexter's Laboratory, The Powerpuff Girls, Johnny Bravo, Cow and Chicken, and Courage the Cowardly Dog (and, to a lesser extent, Family Guy). Theme Tune: There were two of them. The first was a heavy metal piece. Reruns of the show used the Cartoon Cartoon Fridays theme. Thick Line Animation: Some of the cartoons utilized this design style, such as "Pizza Boy in 'No Tip'", "Godfrey and Zeek", "Powerpuff Girls", and "Dexter's Laboratory". To Serve Man: A short called Gramps lampshaded this when a character runs to Gramps, exclaiming what he found before he is hit by a golf club by Gramps, exclaiming, "It's been done!" Wide-Eyed Idealist: Yoink, even though he doesn't die. This page was last edited on 8 October 2017, at 20:13.